This lightweight shower chair is height adjustable and has non-slip ferrules for safety. The frame is anodised aluminium with stainless steel fittings, making it corrosion resistant. Both the seat and the backrest are heavily padded for comfort. The armrests provide additional security to the user and may be flipped backwards to enable side transfer. 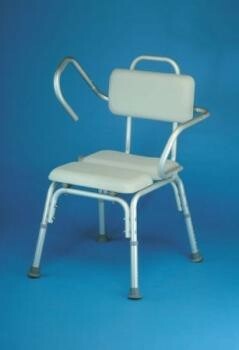 Lightweight Padded Shower Chair...This lightweight shower chair is height adjustable and has non-slip ferrules for safety. The frame is anodised aluminium with stainless steel fittings, making it corrosion resistant. Both the seat and the backrest are heavily padded for comfort. The armrests provide additional security to the user and may be flipped backwards to enable side transfer. 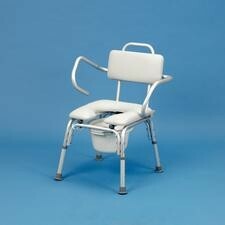 Also available with an aperture in the seat to allow personal cleansing and to aid drainage. Supplied with a pan to enable use as a commode. Maximum User Weight: 211/2 Stone (136 kg). Seat size 405 x 405mm (16 x 16"). Footprint 559 x 610mm (22 x 24"). Seat height adjustment 445 to 545mm (171/2 to 211/2").